Edward "Ned" M. Lamont is the Governor of Connecticut. He is the nephew of Corliss Lamont. 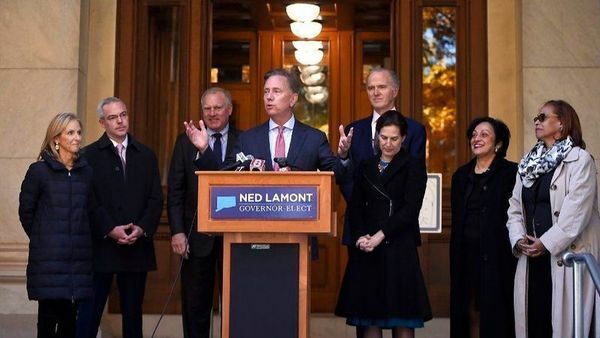 Ned Lamont introduces his transition team in Hartford Thursday. From left his wife, Ann Lamont, and team members, Ryan Drajewicz, Attorney General George Jepsen, Garrett Moran, Dr. Elsa Nunez, and state Rep. Toni Walker. Lt. Gov.-elect Susan Bysiewicz stands in front of Moran. "The 19 leaders picked for the steering committee are: Saud Anwar, a physician and the Democratic mayor of South Windsor; Lisa Tepper Bates, a consultant to nonprofits ; Keith Brothers, business manager with the CT Laborers' District Council; Greg Butler, an executive at Eversource Energy and a Republican; Larry Fox, a former union leader; Rabbi Daniel Ginsburg; Jan Hochadel, president of the American Federation of Teachers Connecticut; Karen Jarmoc, CEO of the Connecticut Coalition Against Domestic Violence and a former Democratic legislator; Beth Kerrigan, West Hartford's Democratic deputy mayor and the lead plaintiff in the lawsuit that legalized gay marriage in Connecticut; and lawyer Bob Martino. "It also includes Tom McCarthy, director of labor relations for the city of New Haven; Jorge Perez, state banking commissioner; Chase Rogers, former chief justice of the state Supreme Court; Democratic state Rep. Chris Rosario of Bridgeport; David Salinas, a technology entrepreneur; Erin Stewart, the Republican mayor of New Britain; Glendowlyn Thames, a Democrat and president of the Hartford city council; Elease Wright, former chief human resources officer at Aetna; Stan Twardy, the former U.S. attorney for Connecticut; and J. Paul Vance, retired Connecticut state police lieutenant and the longtime state police spokesman. In 2006 Edward Lamont received $137 from the Democratic Socialists of America Political Action Committee for his campaign as Democrats candidate for the Connecticut seat in the U.S. Senate Primary and General elections. 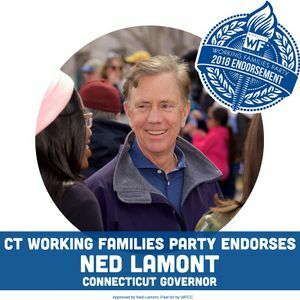 DSA also endorsed Lamont in his primary run. NEW HAVEN — August 8 2018, ss police investigated some type of violent incident near Goffe Street Park Tuesday, community leaders began a march for youth safety from the park. “These communities should be the ones first in line for Yale University and hospital jobs because of the exodus of manufacturing in this town,” Proto said. “This community should be put first.” The promise is close to being realized as the new hires are going through verification now, he said, but “Even after we fulfill this agreement, New Haven is still going to be in a job crisis because there’s need for more than 1,000 jobs. Rev. Scott Marks, left, Ned Lamont center, August 2018. The Democratic hopeful and party-endorsed candidate raised that question inadvertently Wednesday, as he received endorsements from Yale unions UNITE HERE Locals 34 and 35 in New Haven’s Scantlebury Park. As he neared the end of his remarks, he leaned on the words of revolutionary Bob Marley, invoking a song first recorded 45 years ago. From the front of Wednesday’s crowd, labor organizer Scott Marks began clapping and cheering loudly, yelling “Ned! Ned” over a smattering of applause. Lamont brought it home with a tremulous, beaming finish before handing the mic off to Shawn Wooden, candidate for State Treasurer. This page was last modified on 27 December 2018, at 02:40.